iSupport has been in the help desk business for 24 years. We would like to share a few things we have learned along the way. Our whitepapers are free to download and disperse as you like. Our “Complete Guide to the IT Help Desk” eBook normally retails for $9.95, but we are happy to give away a copy in exchange for some basic contact information. We promise not to spam you but may check in once in a while to see if you are satisfied with any help desk software you may be using. 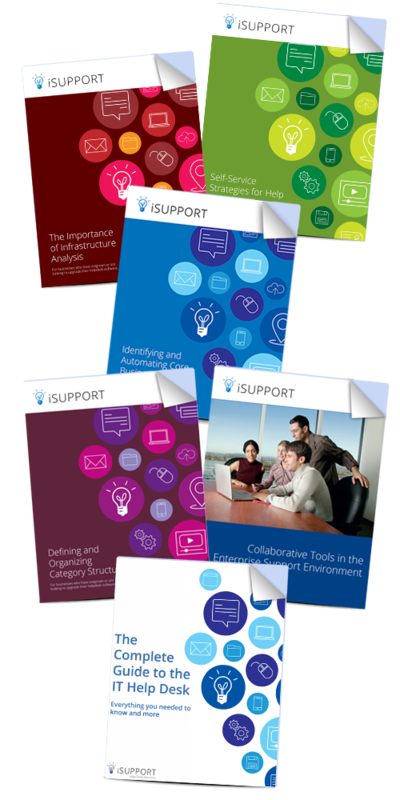 What to consider when analyzing your needs and workflows, implementing automation for peak efficiency, and providing value to your help desk and other areas of the organization. How the categorization process can help to refine processes, identify what works, and discover new ways of enhancing efficiency while providing even better care for users. A look at some of the front end infrastructure analysis and decision making that helps lay the successful foundation for a help desk deployment. How to drive users to your self-service portal so that the help desk—and the wider organization—can realize the great efficiencies that come from users resolving their own issues. Explore some examples of how communication and automation tools can work together to make an entire environment more collaborative. This 29-page ebook examines some of the analysis and decision making that helps lay a successful foundation for help desk deployment.